This topic describes using the BOSH CLI to help diagnose and resolve issues with your Pivotal Cloud Foundry (PCF) deployment. Before using the information and techniques in this topic, review Diagnosing Problems in PCF. To follow the steps in this topic, you must log in to the BOSH Director VM. The BOSH Director runs on the virtual machine (VM) that Ops Manager deploys on the first install of the BOSH Director tile. After authenticating into the BOSH Director, you can run specific commands using the BOSH Command Line Interface (BOSH CLI). BOSH Director diagnostic commands have access to information about your entire Pivotal Cloud Foundry (PCF) installation. Note: Before running any BOSH CLI commands, verify that no BOSH Director tasks are running on the Ops Manager VM. See the Tasks section of BOSH CLI commands for more information. Before you begin troubleshooting with the BOSH CLI, follow the instructions below to collect the information you need from the Ops Manager interface. Open the Ops Manager interface by navigating to the Ops Manager fully qualified domain name (FQDN) in a web browser. Click the BOSH Director tile and select the Status tab. Record the IP address for the Director job. This is the IP address of the VM where the BOSH Director runs. Click Link to Credential to view the Director Credentials. Record these credentials. Return to the Installation Dashboard. (Optional) To prepare to troubleshoot the job VM for any other product, click the product tile and repeat the procedure above to record the IP address and VM credentials for that job VM. Log out of Ops Manager. Note: Ensure that there are no Ops Manager installations or updates in progress while using the BOSH CLI. Use SSH to connect to the Ops Manager VM. Follow the instructions in one of the sections below to log in to the Ops Manager VM with SSH. To log in to the Ops Manager VM with SSH in AWS, you need the key pair you used when you created the Ops Manager VM. To see the name of the key pair, click on the Ops Manager VM and locate the key pair name in the properties. Locate the Ops Manager FQDN on the AWS EC2 instances page. To log in to the Ops Manager VM with SSH in Azure, you need the key pair you used when creating the Ops Manager VM. If you need to reset the SSH key, locate the Ops Manager VM in the Azure portal and click Reset Password. Locate the Ops Manager FQDN by selecting the VM in the Azure portal. Confirm that you have installed the Google Cloud SDK and CLI. See the Google Cloud Platform documentation for more information. Initialize Google Cloud CLI, using a user account with Owner, Editor, or Viewer permissions to access the project. Ensure that the Google Cloud CLI can login to the project by running the command gcloud auth login. From the GCP web console, navigate to Compute Engine. Locate the Ops Manager VM in the VM Instances list. Under Remote access, click the SSH dropdown and select View gcloud command. Copy the SSH command that appears in the popup window. $ gcloud compute ssh "YOUR-VM" --zone "YOUR-ZONE-ID"
Run sudo su - ubuntu to switch to the ubuntu user. To log in to the Ops Manager VM with SSH in OpenStack, you need the key pair that you created in Step 2: Configure Security of Deploying Ops Manager to OpenStack. If you need to reset the SSH key, locate the Ops Manager VM in the OpenStack console and boot it in recovery mode to generate a new key pair. Locate the Ops Manager FQDN on the Access & Security page. To log in to the Ops Manager VM with SSH in vSphere, you need the credentials used to import the PCF .ova or .ovf file into your virtualization system. You set these credentials when you installed Ops Manager. Note: If you lose your credentials, you must shut down the Ops Manager VM in the vSphere UI and reset the password. See the vSphere documentation for more information. From a command line, run ssh ubuntu@OPS-MANAGER-FQDN to log in to the Ops Manager VM with SSH. Replace OPS-MANAGER-FQDN with the fully qualified domain name of Ops Manager. Follow the steps below to log in to the BOSH Director VM. MY-ENV: Enter an alias for the BOSH Director, such as gcp. Internal User Store Login through UAA: Log in to the BOSH Director VM using BOSH. External User Store Login through SAML: Use an external user store to log in to the BOSH Director VM. Retrieve the Director password from the BOSH Director > Credentials tab. Alternatively, launch a browser and visit https://OPS-MANAGER-FQDN/api/v0/deployed/director/credentials/director_credentials to obtain the password. Replace OPS-MANAGER-FQDN with the fully qualified domain name of Ops Manager. Follow the BOSH CLI prompts and enter the BOSH Director credentials to log in to the BOSH Director VM. Follow the BOSH CLI prompts and enter your SAML credentials to log in to the BOSH Director VM. Note: Your browser must be able to reach the BOSH Director in order to log in with SAML. 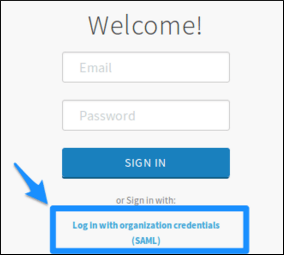 Click Log in with organization credentials (SAML). Copy the Temporary Authentication Code that appears in your browser. From Ops Manager, open the BOSH Director tile. Next to Bbr Ssh Credentials, click Link to Credential. A tab opens containing a JSON credential structure. Copy the RSA PRIVATE KEY and paste it into a file named bbr.pem. Include -----BEGIN RSA PRIVATE KEY----- and -----END RSA PRIVATE KEY-----. WARNING: Pivotal recommends you keep the key secure. The key provides full access to the entire PCF environment. Replace all \n characters in bbr.pem with a line break. Copy bbr.pem to the ~/.ssh/ directory on your machine. Modify the permissions of the file by running chmod 600 ~/.ssh/bbr.pem. Log in to the BOSH Director VM with SSH from your machine. Note: If you are using GCP, ensure SSH port 22 is open for your BOSH Director VM in your GCP console. If the SSH port is not open, open it by creating a firewall rule. Run sudo -i to get the root privilege. This section describes three BOSH CLI commands commonly used during troubleshooting. The bosh vms command provides an overview of the virtual machines that BOSH manages. To use this command, run bosh -e MY-ENV vms to see an overview of all virtual machines managed by BOSH, or bosh -e MY-ENV -d MY-DEPLOYMENT vms to see only the virtual machines associated with a particular deployment. Replace MY-ENV with your environment, and, if using the -d flag, also replace MY-DEPLOYMENT with the name of a deployment. When troubleshooting an issue with your deployment, bosh vms may show a VM in an unknown state. Run bosh cloud-check on a VM in an unknown state to instruct BOSH to diagnose problems with the VM. You can also run bosh vms to identify VMs in your deployment, then use the bosh ssh command to log in to an identified VM with SSH for further troubleshooting. Note: The Status tab of the Pivotal Application Service (PAS) product tile displays information similar to the bosh vms output. Reboot VM: Instructs BOSH to reboot a VM. Rebooting can resolve many transient errors. Ignore problem: Instructs BOSH to do nothing. You may want to ignore a problem in order to run bosh ssh and attempt troubleshooting directly on the machine. Reassociate VM with corresponding instance: Updates the BOSH Director state database. Use this option if you believe that the BOSH Director state database is in error and that a VM is correctly associated with a job. Recreate VM using last known apply spec: Instructs BOSH to destroy the server and recreate it from the deployment manifest that the installer provides. Use this option if a VM is corrupted. Delete VM reference: Instructs BOSH to delete a VM reference in the Director state database. If a VM reference exists in the state database, BOSH expects to find an agent running on the VM. Select this option only if you know that this reference is in error. Once you delete the VM reference, BOSH can no longer control the VM. To use this command, run bosh -e MY-ENV -d MY-DEPLOYMENT cloud-check. Replace MY-ENV with your environment, and MY-DEPLOYMENT with your deployment. Use bosh ssh to log in to the VMs in your deployment with SSH. Identify a VM to log in to with SSH. Run bosh -e MY-ENV -d MY-DEPLOYMENT vms to list the VMs in the given deployment. Replace MY-ENV with your environment alias and MY-DEPLOYMENT with the deployment name.